Eric J. Stover: The "Reaper Main" Overwatch Bingo Card! The "Reaper Main" Overwatch Bingo Card! So I don't know if you're one of the 7 million other people but I've been bitten by the Overwatch bug. I'm in, I'm playing, I'm eating up the characters, the fanart, and the gameplay. 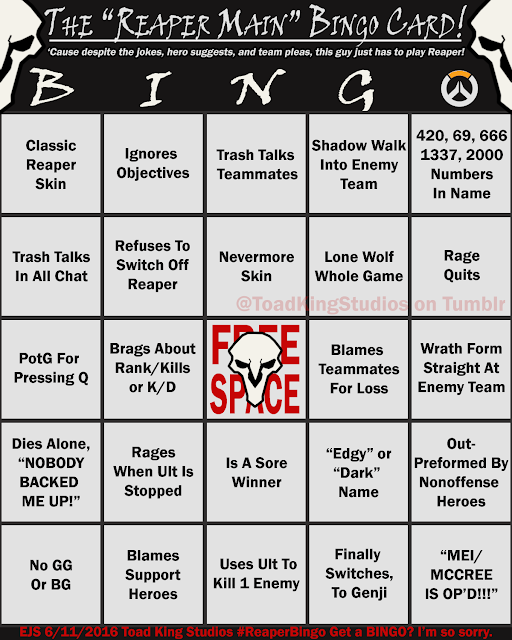 In honor of one too many games with someone who just won't change heroes *cough*shadowling*cough* I made this fun little bingo card about "Reaper mains."